I am an independent concert, music and event promoter based in the Minneapolis / Saint Paul, Minnesota area. I am interested in creating unique, one of a kind, once in a lifetime, never to be forgotten events! I am open to all ideas, suggestions, and comments for any kind of artistic endeavor. Please feel free to email me with your thoughts. FOR IMMEDIATE RELEASE: Introducing RUBY THE DOBERMAN MASCOT! 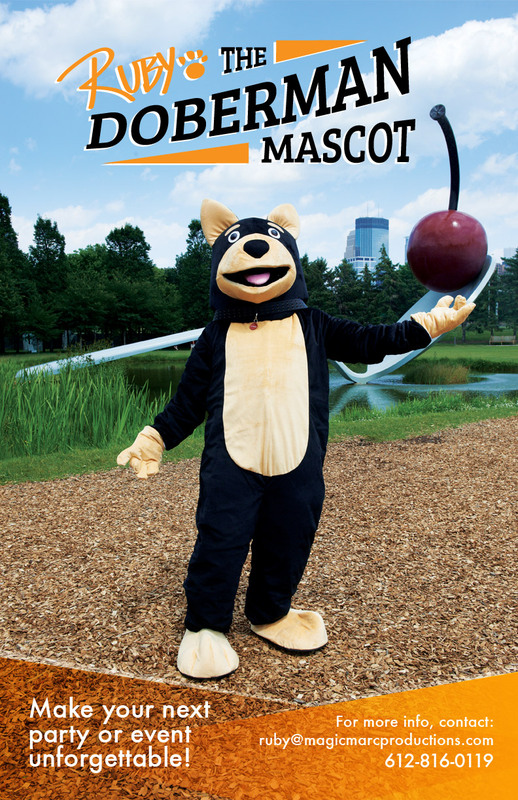 Minneapolis, Minnesota - September 7th, 2014 - Working for RUBY THE DOBERMAN MASCOT is Magic Marc Percansky. Magic Marc grew up as a child performer and magician doing professional magic since 1979 for over 25 years and MC'ing (Master of Ceremonies) many other events in and around the Twin Cities metro area for the past decade. His other experience with mascot's include being an Easter Bunny in 1992 at Rosedale Center Mall and making an appearance as The Grey Chicken at Even Break Gallery in 2013. Recently he has starred along with Ruby in his self produced film RUBY THE DOGUMENTARY. An extreme lover of dogs, children and senior citizens. RUBY THE DOBERMAN MASCOT is the natural evolution of Magic Marc's life in entertainment. He is looking forward and excited to making your next party or event never to be forgotten! As an added bonus RUBY THE DOBERMAN MASCOT may even bring along some friend's too! RUBY THE DOBERMAN MASCOT is available for hire to be the life of your next party or event! For further information, contact: ruby@magicmarcproductions.com or call 612-816-0119 for more details, price and scheduling. Ruby and Magic Marc look forward to hearing from you! RUBY THE DOBERMAN MASCOT - "The Lost Tail"
RUBY THE DOBERMAN MASCOT - "Thee Natural Evolution"